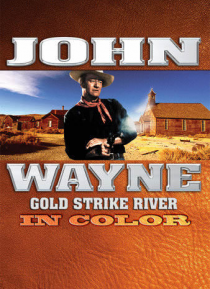 John Wayne is back, swingin' fists and slingin' iron in Gold Strike River! When tough guy Jerry Mason (Wayne) and cranky but loveable Jake Benson (Gabby Hayes) strike it rich on a gold claim, they become the target of two ruthless assayers. Featuring a thrilling horse/train car/Model-T chase and the groundbreaking stunt work of the legendary Yakima Canutt, Gold Strike River has been beautifully re… stored and is in gorgeous color for the very first time!